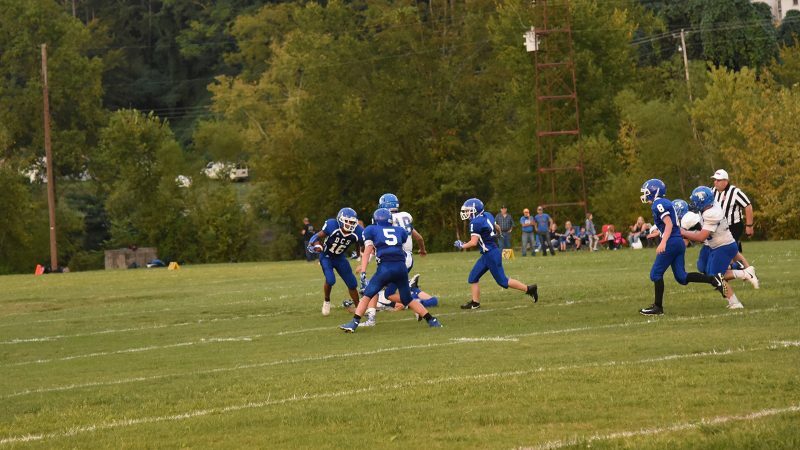 Dayton, TN — Dayton City School football lost to Bledsoe Middle 54-26 on Thursday in a home game for the Sweatbees. With the loss the season record for Dayton City goes to 2-2. Bledsoe scored two first quarter touchdowns to take 16-0 lead before Elijah Davis had a long 50 yard run for the Sweat Bees to make it 16-6 just before end of first quarter. In the second quarter the Sweat Bees made a stop deep in their own territory and then Elijah Davis went left but just before hitting the sidelines, he reversed field and went right and outraced Bledsoe defenders for 95 yards to pull DCS within 16-14 after the Tyler Dupre two point conversion run with around 3 minutes left in the half. Two more touchdowns scored over the next three minutes. First Bledsoe took a short kickoff and returned ball deep into Dayton City territory before they punched the ball in for 24-14 lead with little time left in the half. Dayton brought the ball up the field with Davis and Dupre getting big yards before the toss back from quarterback Garcia to Tyler Dupre caught the Bledsoe defense napping and Dupre hit a streaking Mike Hill for the touchdown to cut lead to 24-20 at the half. Dayton City received the second half kickoff and drove down the field and with just under seven minutes left in third quarter a precarious looking screen pass to Tyler Dupre went the distance for 55 yard touchdown to give Sweat Bees the lead 26-24. Lead was short-lived as Bledsoe returned kickoff to around mid-field and then Cadillac Seabur took the ball at midfield and ran up the middle and then down the left sideline to give Bledsoe the lead 30-26. Luke Pendergrass added the 2 point conversion for 32-26 lead for Bledsoe but DCS was still within striking distance. Dayton City’s drive stalled and they turned ball over on downs at the Bledsoe 33 yard line. Bledsoe hit a long pass to take the ball down to the Sweat Bee 13 yard line and a couple of plays later the Bledsoe quarterback took the ball in for the touchdown and conversion made the score 38-26. Dayton City’s hopes slipped from their grasps as a fumble was recovered by Bledsoe on the next DCS possession. It was Seabur with another touchdown to give Bledsoe and 44-26 lead. Dayton City took the kickoff and was driving until another fumble ended the drive and Bledsoe went on to score another touchdown for 52-26 lead. Sweat Bees were not done and it was Dupre with another screen pass for touchdown from just outside the 30 yard line to pull DCS within 52-32. Two point conversion was intercepted and returned by Bledsoe to the other end zone and that essentially ended the game.